Tonghai Financial Chinese New Year Cup, title sponsored by Tonghai Financial and hosted by Hong Kong Football Association and RedMR Sports, was successfully completed on 5 and 7 of Feb 2019. China Tonghai International Financial Limited, being the Official Financial Partner of Hong Kong Tennis Open last year, has been committed to support iconic tennis event again in the beginning of 2019. 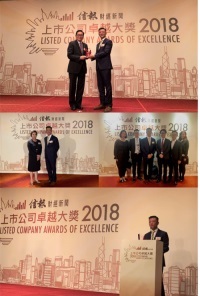 China Tonghai International Financial Limited ("Tonghai Financial") is pleased to announce that the company has been awarded "Listed Company Awards of Excellence 2018" by the Hong Kong Economic Journal. Hong Kong Tennis Open 2018 was successfully held on 6-14 October 2018 at Victoria Park Tennis Stadium.